Primrose Cottage is a quality detached barn conversion with wonderful views of the Taw Valley, in a rural setting in Burrington near Chulmleigh. The cottage has a king-size and a twin bedroom, and a family bathroom. Downstairs is the open plan living area with kitchen, dining area and sitting area with woodburner and patio doors outside. There is off road parking for two cars, a private front garden with furniture and BBQ, and use of the owners' acres of meadowland. 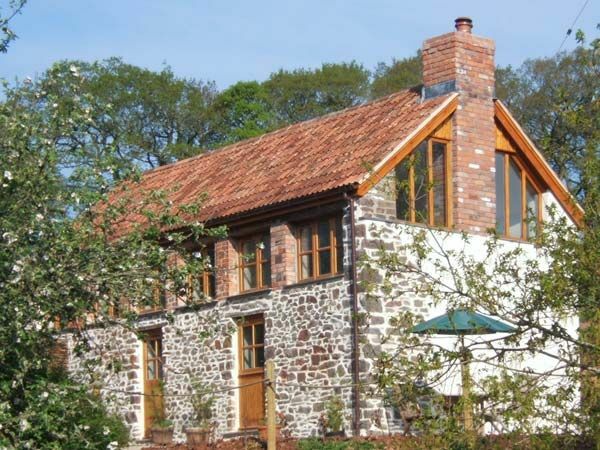 Primrose Cottage makes a wonderful family base for exploring North Devon, from the countryside and riverbanks to the beaches and coastline. Amenities: Underfloor heating with woodburning stove. Range cooker with electric oven and gas hob, microwave, fridge, freezer, washer/dryer, dishwasher, TV with Freeview, DVD, radio/CD, iPod dock, WiFi, selection of books, games and DVDs. Fuel, power and fuel for stove inc. in rent. Bed linen and towels inc. in rent. Travel cot, highchair and stairgate on request. Off road parking for 2 cars. Private garden with patio, furniture, gas BBQ and garden games, plus use of owners' 42-acre meadow and woodland. Sorry, no pets and no smoking. Shops and pub 2 miles. Note: Bicycles, canoeing, fishing, horse riding, babysitting and taxi service by arrangement with owners. Note: Grocery delivery can be arranged in advance of your arrival. Town: Chulmleigh is an attractive Devon village with thatched cottage, impressive church, cobbled lanes and a welcoming inn. Chulmleigh is ideally placed for both the north and south coasts, the shops and restaurants of Exeter, and plenty of wonderful walking, fishing and birdwatching. Two bedrooms: 1 x super king-size double (zip/link, can be twin on request), 1 x twin. Bathroom with double-ended bath, hand-held shower, basin and WC. Open plan living area with kitchen, dining area and sitting area with woodburning stove. Underfloor heating with woodburning stove. Range cooker with electric oven and gas hob, microwave, fridge, freezer, washer/dryer, dishwasher, TV with Freeview, DVD, radio/CD, iPod dock, WiFi, selection of books, games and DVDs. Fuel, power and fuel for stove inc. in rent. Bed linen and towels inc. in rent. Travel cot, highchair and stairgate on request. Off road parking for 2 cars. Private garden with patio, furniture, gas BBQ and garden games, plus use of owners' 42-acre meadow and woodland. Sorry, no pets and no smoking. Shops and pub 2 miles. Note: Bicycles, canoeing, fishing, horse riding, babysitting and taxi service by arrangement with owners. Note: Grocery delivery can be arranged in advance of your arrival.